I'm sorry to inform you that I won't meet the deadline for the update to version 0.85. There are still too many issues that need to be sorted out and tested before I can release the new version in good conscious. Compatibility issues with the new sound engine. Fast-regime engine simulation. There's a big bug in the code that creates an overflow in the pressure variables of the cylinders. I know that you're all eagerly waiting for the next release and I apologize for the delay. I'll probably need an additional two weeks to sort everything out, so expect the release for version 0.85 for the second week of October. During checkout, click on "have a promo code?" 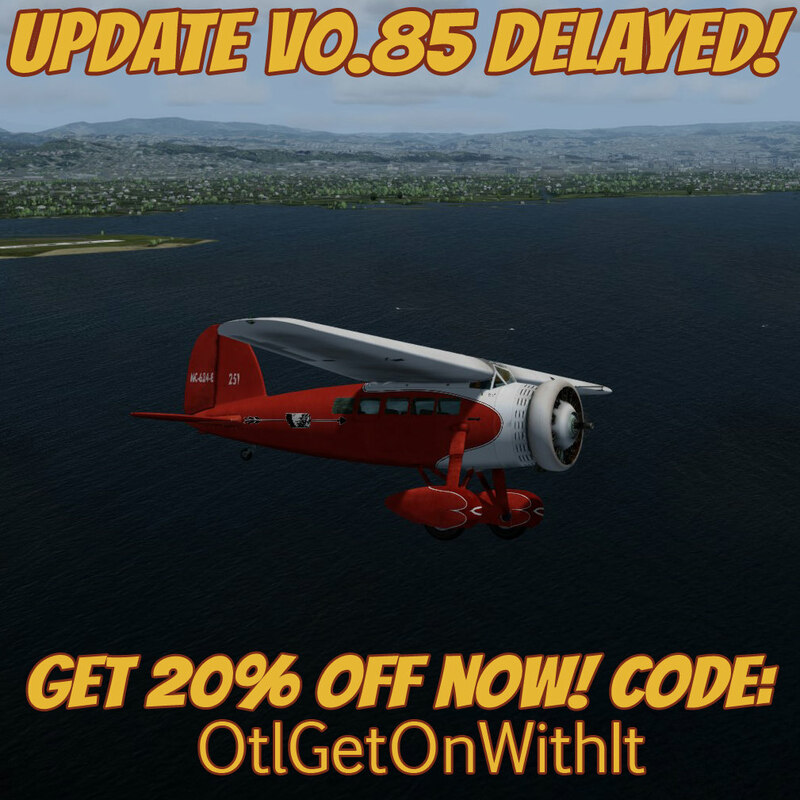 and type "OtlGetOnWithIt" in the field to receive the 20% discount on the Lockheed Vega. No problem! Better to wait to will have better model ! Thx for info. Yes,I agree take your time and get it right.If you need any testing email me. No problem at all...because I know it will be great when it’s ready. Really do appreciate your transparency on the development. Keep up the outstanding work. No rush, keep the good work. So any news or preview Otmar? Dont rush, no problem with this but Id like to see something new (if You have it), just one shot will be ok . He's alive, taking nourishment, and has now learned that you never, EVER, suggest a release date. When its time, it's time. A bit strong Tom.He wasnt asking for a release date. Yoyo has been simming a long time and English is not his native language. Yike, that wasn't intended as strong in any way, my sincere apology. My opening statement about him being alive and taking nourishment, I thought, would signal I was being sarcastic and silly. And my comment about "never, EVER" was, I thought, so overblown that it would be seen as a tease to Otmar. But I can see how someone could misunderstand my comment.